Young, up-and-coming illustrator William Grill weaves a detailed visual narrative of Shackleton's journey to Antarctica. Grill's beautiful use of colored pencils and vibrant hues effortlessly evokes the adventure and excitement that surrounded the expedition. His impeccably researched drawings, rich with detail, fastidiously reproduce the minutiae of the expedition. A graduate of the University of Falmouth, William Grill is an exciting young talent with a slew of prizes under his belt, including being the youngest CILIP Kate Greenaway Medal winner since 1960. "Mr. Grill's manner of illustration lends itself beautifully to the juxtaposition of early-20th-century human ingenuity and the raw, indifferent power of nature." "A book every house should have." "A magnificent chronicle by emerging illustrator William Grill, whose affectionate and enchanting colored-pencil drawings bring to life the legendary explorer and his historic expedition." "A perfect picture book for any would be historian or adventurer. " "Author William Grill does an excellent job telling this story so that the book can be both a resource for a child’s book report as well as a captivating picture book for anyone wanting to learn about this expedition. But even more powerful than the narrative are the detailed and dramatic illustrations, done in colored pencils, many which, if framed, would look stunning on a wall. To top it all off, the textured book cover and raw, thick pages make this a book to flaunt on your coffee table or child’s bookshelf." "This is a book that will appeal to adult art lovers, picture book fans and history buffs (of which, I fall into all three categories), children and adult alike. The book’s large format gives ample space for detailed colored pencil illustrations and the perfect pacing for such a fascinating journey." "Another gorgeous book, ‘Shackleton’s Journey,’ by William Grill, recounts the adventures of the notorious polar explorer. Who knew that staffing for Shackleton included questions about the candidates singing ability? A quirky man indeed." "What a remarkable book, and a harrowing story of bravery, endurance and hope! [...] Beautifully illustrated and endlessly compelling, it is a tribute to explorers, their bravery and their hopes." 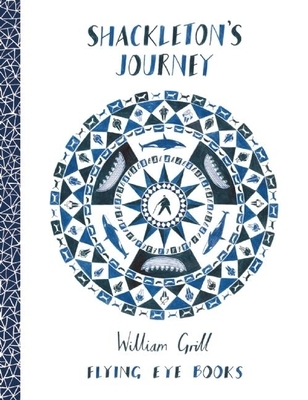 "William Grill’s well designed book is the perfect introduction for young readers to get a sense of the Endurance expedition." "An example of the arty but accessible [...], the sketches evoke the feeling of a naturalist’s diary with an almost documentary feeling as we peek into the mundane (six months provisions) isolating hardship (crossing the ice fields) and relief (rescue and survival)." "The meticulously detailed colored pencil illustrations highlight the planning, the departure, the voyage, the rescue efforts, and the successful return of the crew after the loss of the Endurance on the ice."